Transform the communication with your Customer. Offer a unique and appropriate Customer Experience using the most advanced Big Data and Machine Learning technology. Big Data & Cloud will empower your company to acquire, integrate and manage huge amounts of information in real time in order to get the best out of all your customer's information. Listen and respond, anticipate, reward. Be proactively engaged and reach the right customer at the right time, through the right channel. According to the Harvard Business School, increasing customer retention rates by 5%, increases profits by 25% to 95%. Wyred allows your company set and meet customer expectations, and set customer retention strategies from the outset, establishing a proactive and ongoing dialogue. 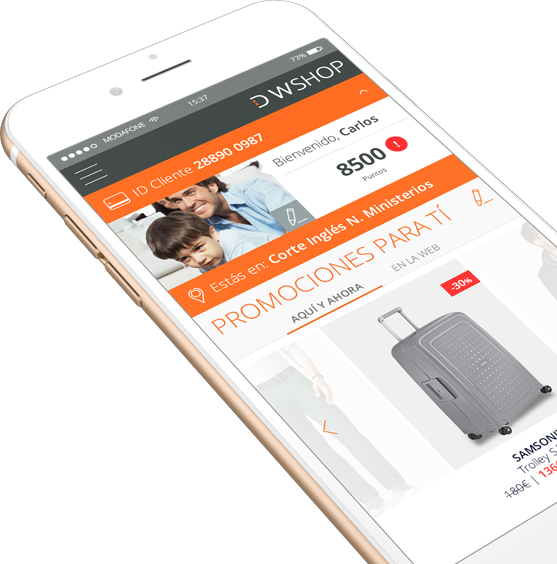 At Wyred we use powerful algorythms to automatically and in real time recommend the most relevant ítems for each individual customer through the entire shopping journey. “66% of customers want businesses to ‘know my history when I call’”. At Wyred we help our clients to strategize, set up, keep and optimize those ongoing and personalized dialogues with their customers at scale, as well as to measure the results and ROI of those strategies. Wyred helps you reducing costs by decreasing the number of calls to the call center, by having only one software supplier, and by managing all the channels at the same time and in the same platform. We help personalizing every channel of communication between your company and your customers taking into account business goals and customer profile, creating unique experiences. We integrate all your channels in one platform so that you can send out powerful messages consistent through every channel. Our platform measures the success of each interaction with your customers, and helps you make the most of them, maximizing their profitability and satisfaction. Knowing the needs of every customer allows you giving them the best personalized experience. Mobile is the always-in-touch channel! Send push notifications with your Mobile app to engage customers, relevant news, alerts, and promotions. Personalize the user area, and connect your events or stores with the digital through the App. Allow instant communication. You can deliver a personalized web experience to your present and future customers. Personalize and recommend content and offers in the personal area, deliver complete information and allow inbound communications. Study your customers behavior and predict the future to engage and re-engage. 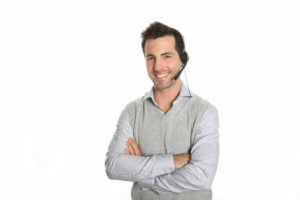 Improve IVR experiences by personalizing the menu. Anticipate to your customers requests by studying their behavior and employ natural language interpretation. Be available 24 hours, 7 days per week and give the best quality self-service. Social Media allows your Company to engage those users that are potential customers and to make a previous segmentation of the existing ones. 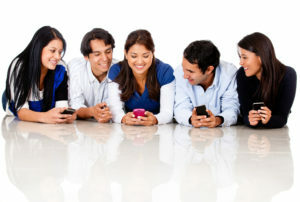 Furthermore, it allows increasing efficiency and reducing Customer Care costs by instantly communicating with them. Use Email to send personalized newsletter and campaigns to target groups or individually. Automate data imports, reporting and sending in order to become more efficient. Track, optimize, design and delight! Use Mobile messaging to reach your customers at any moment and wherever they are. Deliver SMS/MMS personalized campaigns, shipping confirmations, account information, new offers, fraud alerts, and a wide range of actions. Relations never fail when they are built face to face. Send messages to the agents at the point of sale through their platform and give them predicted answers to offer the best service. Connect your point of sales with the app to promote products or services and deliver personalized reccomendations to your customers with a geolocation. 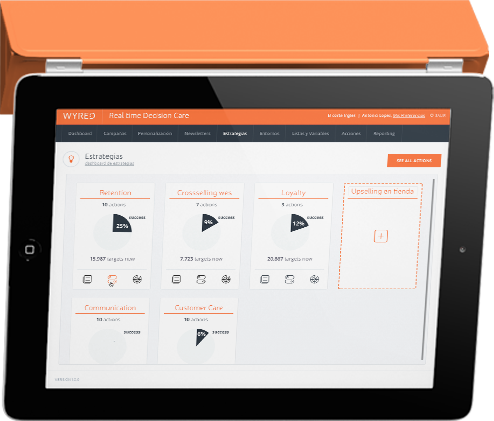 WYRED offers a Software as a Service Decision Support System allocated in the Cloud and focused on the Customer Multichannel Experience. This software supports management, planning and operations to make real- time decisions. More specifically, it helps to make a customer segmentation by profile characteristics and past interactions in order to easily differentiate them and so communicate with them in a personalized way through every different channel: app, email, web, sms, social media and even IVR. Big Data are the sets of data that inundates a business on a day-to-day basis, which are so large and complex that need to be analyzed computationally to reveal patterns, trends, and associations. Big Data are employed altogether with Cloud to manage huge amounts of information in real time in order to get the best out of all your customer’s information. So, Big Data gives you data, Advanced Analytics gives you information, and Algorithms gives you knowledge with which to generate value through derivative actions with Artificial Intelligence. Artificial Intelligence improves agent productivity, anticipates the intent of customer and helps agents contextualize an incoming call, empowering them to provide customers with the best treatment. It allows your Company taking personalized decisions based on the information entered by marketing and customer care specialists, as well as improving decisions taking into account the relation established between the company and the customer, based on business goals and measuring economical impact.